Identification: This is a cream animal reticulated with brown or gray. The parapodia are margined in iridescent yellow-green and the reticulations extend onto the foot (unlike in Tubulophilinopsis pilsbryi). Natural history: Tubulophilinopsis sp. #1 is a moderately rare nocturnal species found in mixed habitats at depths of about 1 m (3 ft). It occurs in moderately protected to highly exposed sites. It lays a barrel-shaped, white egg mass composed of a tangled egg string. The mass may be anchored in sand or algal turf and is usually shorter than in Philinopsis speciosa. Hatching occurs in about four days in the laboratory. Distribution: Big Island, Maui and Oahu. Taxonomic notes: Tubulophilinopsis sp. #1 has been listed on-line as a form of Tubulophilinopsis reticulatus. However, Terry Gosliner feels there are enough differences from the Indo-Pacific populations of that species to suggest a split. (pers. com.) It was first recorded in Hawaii from Pupukea, Oahu by Scott Johnson on Aug. 12, 1985. 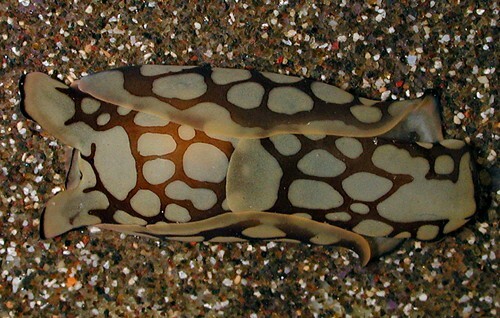 It is illustrated as "Pilsbry's headshield slug" in Hoover, 1998 and in the inset photo under that species in Hoover, 2006. A related form is illustrated in Gosliner, et. al., 2018 as a Philinopsis sp. Photo: CP: 30 mm: Napili Bay, Maui; Sept. 22, 2006.